Indiana Governor Mike Pence has won approval from the Obama administration for a Medicaid waiver that begins the transformation of the program toward a consumer-directed model. Gov. Pence is building on the popular and successful Healthy Indiana Plan (HIP) created by former Governor Mitch Daniels in 2007. Both of them pushed the envelope with Health and Human Services officials who were determined to perpetuate a hide-bound program that is ill-serving tens of millions of recipients while gobbling up state revenues. Gov. Pence and his staff worked directly with White House officials to overcome this inertia and set down some new markers for future reform. Gov. Pence announced today that the administration has approved Healthy Indiana 2.0 that will require contributions from all able-bodied Hoosiers participating in the program. It also creates an Employer Benefit Link that provides a Medicaid contribution for recipients who are eligible and participating in employer-sponsored health insurance plans. In addition, recipients who do not make their required contributions toward their health benefits can be locked out of the program for six months. All recipients will be required to make a contribution toward their Medicaid benefits, even those who are at the lowest income eligibility levels. While conservatives are sure to criticize this plan as an expansion of Medicaid, I see it as taking advantage of an opportunity to lay the groundwork for the kind of Medicaid reform that we must move toward in the future. It would not be possible to rip out this program root and branch and replace it with a consumer directed model. By winning approval of these changes through a Medicaid waiver, other governors have a much stronger platform to move toward other changes that will work for their states. HIP creates a POWER Account that is jointly funded on a sliding scale by the recipient and the state. Recipients at 138% of poverty must contribute $54.86 a month for a family of four to participate, for example. Families at 100% of poverty have to contribute $39.75 a month. If they do not make their contribution, they face the lock out. The $2,500 POWER Account gives people an incentive to monitor their spending for their routine medical expenses. There also are penalties for unnecessary visits to emergency rooms. Absent Obamacare, many conservatives would praise this effort to make Medicaid look more like a Health Savings Account and catastrophic high-deductible coverage. This is an important start toward much-needed changes to this public program. 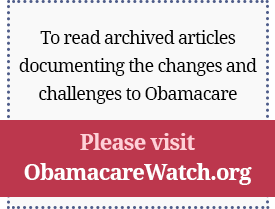 By using the ObamaCare waiver option that the administration wanted, Gov. Pence has gained important and potentially transformative changes to Medicaid. This is a win.